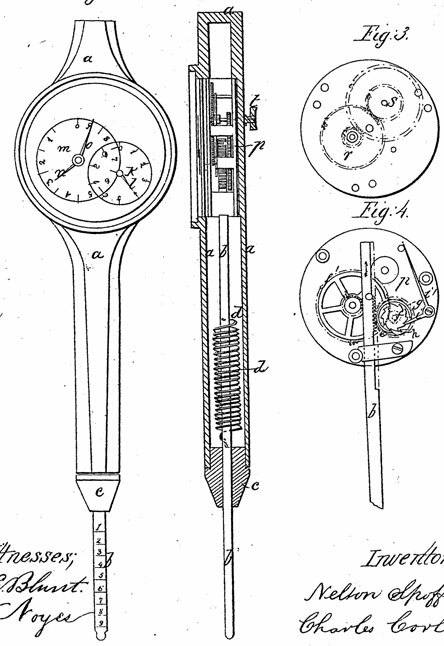 In 1868, Charles Corliss, a farmer and landowner from Haverhill, Massachusetts, received two patents (one of the patents is granted to him and Nelson Spofford, another inventor from Haverhill, who was a holder of quite a few US patents for various devices) for instruments for adding and registering numbers (US patents US79209 and US79272). Similar small calculating instruments will be reinvented many times during the next several decades (e.g. see Addirstift of Oskar Leuner from 1877). Let's study the operation of the instrument, using the drawing of the patent US79272, shown below (strangely enough the second patent has a lower number—US79209 is the second patent, but not US79272, although both patents have the same date—23 June, 1868). The invention consists of a graduated sliding rot, confined within a casing, with one end projecting a short distance from the said casing, and at the other end connected with a system of gearing or watch-work, made to operate indicators upon a dial plate. Let's suppose a column of figures is to be added up; the instrument being grasped in the hand, the end of the bar b is placed at or near the figure to be added, each one in succession. The instrument is then pressed down, and the bar b forced into the casing, until the end of the latter is coincident with the line or mark having the figure or number, corresponding with that at which the end of the bar is placed near; the same number is at once indicated on the dial k.
The instrument being raised, the bar b is projected by the spring d, when it is again pressed upon the next figure, and so the process continues, each figure or number being taken by the end of the bar, and the total amounts successively registered on the dials. For instance, should the bar b be moved into the casing until the graduated line marked 3 is coincident with the end of the head c, the indicator l will point to the number 3 on the dial-plate k, and each successive number indicated on the graduated bar will be added to the amount, already indicated on the dials. The graduations on the sliding bar may be omitted, and the said bar be made to act directly on the dial-plate, denoting the units, so that the figures to be added will correspond with those on the dial-plate. The object of the second patent is to improve the first one, substituting a dial to indicate the numbers to be added in the place of the graduations marked on the sliding rod or bar in the above-mentioned device. A further object is to provide a means for instantaneously resetting the instrument after registering any required amount. Who was the inventor—Charles Corliss? Charles Corliss was born on 5 April, 1827, in his family estate in Haverhill, MA, the first child of not so young, but just married (in 1826) Ephraim Corliss (1782-1858) and Nancy (Carleton) Robinson (1791-1862). Charles had two younger sisters—Caroline (1829-1914) and Mary (1832-1913). Corliss family are descendants of the early settler George Corliss (1617-1686), born in Exeter, Devonshire, England. He came to America in 1639, and settled at Newbury, MA, but soon after he moved to Haverhill, MA, which was began as a farming community of Puritans, where he resided until his death in 1686. George Corliss founded a farm, later known as "Poplar Lawn" (see the lower drawing and note the beautiful poplars near the fence), which has never been out of the possession of his direct descendants for the next 250 years. 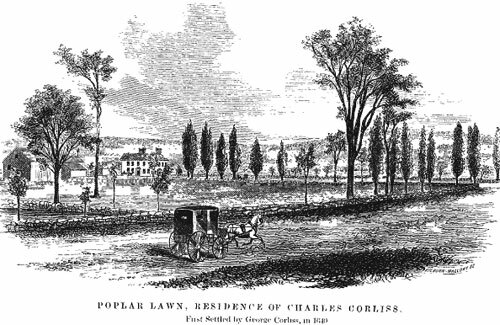 Charles Corliss inherited Poplar Lawn after the death of his father in 1858 (Charles was of the seventh generation from the original grantee) and lived there, taking care for the farm, containing about 50 acres, until his death in 1897. Charles Corliss owned rare breeds of sheep, and was fond of carpentry. He built a new house at 33 Highland Avenue, Haverhill and moved to it in 1881. Corliss had an excellent memory and found time for deep study of sciences, was a keen student of poetry of life (he could read from memory Scott's long Scottish epic, The Lady of the Lake), and was an art critic. He designed a Merrimack Valley flag. Charles Corliss had plans for cheaper transportation and was a president of the Haverhill and Lawrence Railroad, a company which had a project to build a railroad in Merrimack Valley, MA. In 1890 Corliss even announced in the local newspaper, that he laid out in his land in Bradford (Ward Hill) twenty-five lots of land and will give, free of expense, if the railway is built within two years, to subscribers for the capital stock of Haverhill and Lawrence Railroad. Corliss planned to give the land free to purchasers who bought several shares. The stage had been set, but the state government had another plan—to build a trolley line in the valley. Corliss journeyed to Boston to speak before a legislative committee which was considering a proposal that the Commonwealth of Massachusetts spend $400,000 to establish the new railway. His words however were ignored and the trolley line became a reality. The great Haverhill and Lawrence Railroad finally went out of business. Corliss and his associates also had plans to make Merrimack River navigable above Haverhill, building a lock and dam, and to establish a new city (called Buena Vista) on a hill near the river. They planned to use Mitchell Falls near Haverhill to provide power for Buena Vista and to built a brand new hotel, reasoned to attract tourists. The tourists, in turn, would fall in love with the great beauty of the place and rush out to buy land there. Houses, schools and civic buildings would spring up. And industries would begin moving into the area which already had shoe factory. In no time at all, a thriving city would burst forth where once there had been only dense woodlands. The beginning was promising. The pretty Buena Vista Hotel was built, but just before the opening, in April 1891, a spring storm of no mean proportions, a real cyclone, destroyed the brand new hotel. Later the hotel was rebuilt and worked until 1910, but the stockholders and future investors lost interest and the project for Buena Vista city failed. Charles Corliss married late, as his father. On 6 October 1875 he married to Celia Davis Hatch Bird of Boston, Mass. They didn't have children. 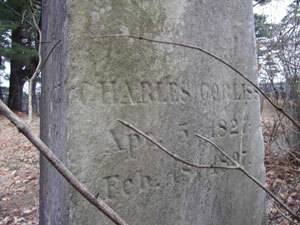 Charles Corliss died on 18 February, 1897, in his residence, and was buried in Linwood Cemetery, Haverhill (see his gravestone below).